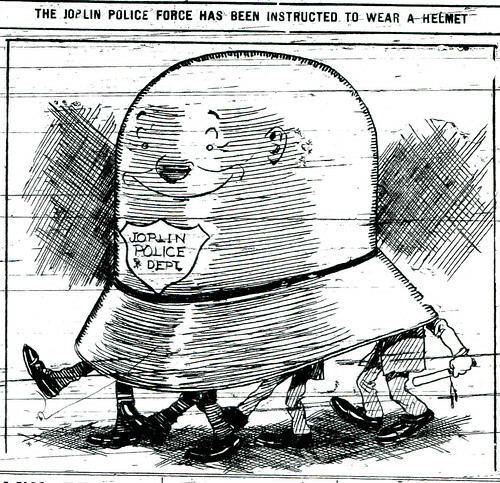 On a hot summer night 1904, the Joplin City Council was in session when someone raised the issue of the “dress of the Joplin policemen.” A simple complaint about enforcing Joplin’s helmet ordinance revealed many of the underlying problems plaguing the Joplin police force. Like many law enforcement agencies at this time, the Joplin police force was undermanned, underpaid, and overworked. They were expected to maintain law and order in a city wracked by cocaine abuse, plagued by saloons, riddled with gambling dens, and infested with men ready to fight at the drop of a hat. Wearing a helmet was of little concern to a member of the Joplin police force. The mood of the Joplin Police officers were quite the opposite as expressed in this cartoon. Councilman Kost reminded attendees that the council had previously passed an ordinance requiring police officers to wear helmets and carry a “policeman’s club of certain size.” According to Kost, few members of the Joplin police force were complying with the ordinance. The Joplin Globe noted that prior to the ordinance, Joplin police officers were allowed to wear “slouch hats” and very few carried a club. Curiously there was no mention of the death of Joplin police officer John Ledbetter who was killed the previous summer by a rock wielding assailant, though a helmet may not have been enough to save his life. Unfortunately, helmets and clubs were not enough to save the lives of subsequent Joplin police officers killed in the first few decades of the twentieth century.